While we do not often think of our teeth in terms of living and non-living, our teeth are actually living components of our bodies. It may be strange to think that a tooth is “alive,” but if you understand the make-up of a tooth then it really is easy to grasp. Each tooth is made up of three layers: the enamel, the dentin, and the pulp. While the enamel is the hard, white substance that is visible in our smiles, it is the inner layers of the teeth that keep them alive. The dentin layer and the pulp of the teeth contain nerve fibers and blood vessels that allow them to sustain life. As with every part of the body, a tooth cannot survive without a constant supply of blood. When decay, infection, or trauma occurs to cut off the blood flow to a tooth it will die inside the mouth and can lead to a whole host of complicated issues. It is essential that all dental cavities be treated by a dentist in a very timely manner. When cavities are small, they can easily be filled in order to restore the health of a tooth and prevent the decay from spreading. However, if dental cavities are ignored and allowed to progress, the decay and infection will eventually reach the dentin and pulp of the tooth. 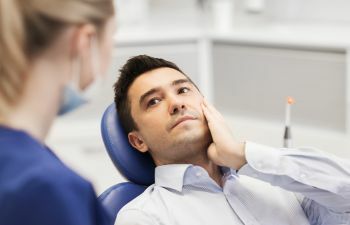 Once this occurs, irreparable damage will be done to the inner structure of the tooth, causing blood vessels and nerves to be damaged so that the tooth is no longer connected to the body’s blood flow. Once this occurs the tooth will be dead, and it will be necessary to for a root canal treatment to be done or for the tooth be be extracted from the mouth. The same fate can occur with trauma to the mouth, although the death of a tooth usually happens almost immediately. When injury or trauma causes a tooth to be knocked out or severed from its blood supply, it can instantly lose its supply of blood. Any injury to the mouth needs to be evaluated by a dentist immediately for any hope of saving the tooth. If you are here in the Fort Mill area and are concerned that you may have a dead tooth, please contact our dental practice right away. At Gold Hill Dentistry, we are here to provide the highest standard in dental care.